Cayenne peppers are delicious spicy chili peppers that are packed with medicinal properties, vitamins and minerals. People have been using cayenne peppers for thousands of years to spice up food and for their healing power. Cayenne pepper powder is full of antioxidants and helps reduce inflammation, prevents heart disease, and boosts your digestive health. Most of the health benefits of cayenne pepper are due to a compound in the chili called capsaicin. This is the active component in chilies that give them their spicy kick. The health benefits of using cayenne supplements don’t just apply to consuming this type of chili pepper. You can apply cayenne pepper capsaicin cream to relieve skin disorders and alleviate nerve pain and migraines. What is it about cayenne pepper that makes this chili pepper so useful in treating many health problems? In this article, you will learn about the many health benefits of cayenne pepper. You will also find out how to use capsaicin for its many therapeutic uses. Cayenne pepper is a type of hot chili pepper in the Capsicum annuum species of plants. Cayenne peppers are related to bell peppers, jalapenos, and other types of chilies. Cayenne pepper contains vitamins and minerals that provide many health benefits. Cayenne pepper is low in fat and carbohydrates and contains vitamins A, C, K, and E. Many of these vitamins have antioxidant properties that strengthen your health. As well as the above-mentioned nutrients, cayenne pepper also contains traces of B-group vitamins, protein, calcium, magnesium, selenium, copper, and zinc. Let’s look in more detail at the many reasons why taking more cayenne pepper in your diet could be good for you. One of the most important health benefits of consuming more cayenne pepper is due to its anti-inflammatory activity. Please see my previous article to find out more natural alternatives to NSAIDs. At the end of the article you can find out how to make a cayenne pepper drink for pain relief. Applying topical creams containing capsaicin extract can help to relieve the symptoms of arthritis like joint pain. If you suffer from joint pain, find out how to make your own capsaicin oil in my article on the best spices for joint pain relief. Another medicinal use for applying cayenne pepper ointments is to relieve nerve pain and headaches. Please read my article on the best ways to relieve a migraine, or try these essential oils if you suffer from frequent migraines. Cayenne pepper may also help to lower blood pressure if you suffer from hypertension. One of the ways that cayenne pepper seems to lower blood pressure is by decreasing the amount of salt stored in the body. If you suffer from hypertension, please read my article to learn how to lower blood pressure naturally. Cayenne pepper capsules can help to improve risk factors of coronary heart disease. A randomized, double-blind controlled clinical trial found that capsaicin supplements significantly increased HDL cholesterol levels. This is the “good” type of cholesterol that is associated with heart health. Did you know that 80% of heart attacks could be avoided by doing 5 simple things? Taking cayenne pepper supplements can help prevent blood clots forming in your arteries. Please read my related article about blood clot in leg: signs and symptoms you shouldn’t ignore. Cayenne pepper drinks or taking cayenne powder supplements can help you lose weight quicker. Let’s look at some of the ways that cayenne pepper can help you lose weight. Please read my related article about 12 simple tweaks for weight loss. It may surprise you to learn, but the spicy components in cayenne pepper can actually promote healthy digestion. Contrary to popular belief, chili powder doesn’t cause ulcers but can actually help heal gastric ulcers. You can find more natural treatment for stomach ulcers in this article. One of the benefits of using creams containing extracts of the cayenne pepper plant is to treat inflammatory skin conditions. Psoriasis is a chronic skin condition that causes patches of red, scaly skin on your body. Dermatitis can be caused by irritants on the skin and results in inflamed skin that is itchy and sore. Although the capsaicin cream may sting initially, with continued use, the sensation of pain goes down. Read my other related articles about natural ways to relieve psoriasis and natural remedies for eczema. Research into the properties of cayenne powder extract has revealed their potential for use in treating various cancers. Researchers are still investigating the potential use of cayenne pepper to treat cancer in humans. There are various ways to use cayenne pepper to take advantage of its health benefits. For example, you can make spicy cayenne pepper water for a therapeutic drink. All you have to do to make a cayenne pepper drink is mix one-quarter to half a teaspoon of cayenne pepper powder (preferably organic) in a glass of hot or warm water. Some people prefer to mix half a teaspoon cayenne pepper powder in juice, smoothie or stir it into their tea. You can also use topical cayenne pepper ointments, oils, lotions, or creams to help relieve painful skin conditions. Many studies have shown that topical application containing between 0.025% and 0.1% capsaicin to be the most effective for treating pain and various skin conditions. Capsaicin cream should be applied 3 or 4 times a day. You should start to notice a reduction in pain after several days. Cayenne pepper is also sold in capsules or tablet form as capsaicin extract. You can buy supplements ranging between 500 mg and 1,000 mg capsules. Cayenne pepper oil can be helpful in treating certain cases of rheumatism, as well as for various other muscle aches and pains including back pain. The recipe is taken from my article about the best spices & herbs to relieve pain. Mix all the ingredients in a glass jar, and leave to infuse for 1 week. Strain the oil and massage the capsaicin oil into the affected areas to treat muscle and joint pain. How Much Cayenne Pepper to Take for Health Benefits? There is no set dosage of capsaicin extracts to take for health benefits. If you decide to take supplements, most manufacturers recommend around 1,000 mg per day. This is claimed to improve gastrointestinal health, help in losing weight, and lower blood pressure. If you want to use cayenne pepper, you can try making your own cayenne pepper tea. Mix between 1/4 and 1/2 a teaspoon cayenne pepper in a glass of warm water. Drink 2 or 3 times a day for best results. To improve the taste of cayenne pepper drinks, you could add a squeeze of lemon juice with 1/4 teaspoon of ginger powder to really boost the health benefits of cayenne powder water. 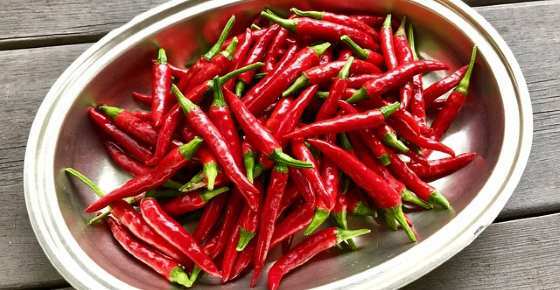 Cayenne pepper can irritate the skin and cause a lot of pain if it gets into your eyes. Therefore, you should exercise care when handling cayenne powder. If applying capsaicin cream topically, always wash your hands after using the ointment. Never use cayenne pepper ointments around the sensitive skin of your eyes. Don’t use capsaicin creams on broken skin. Consuming too much cayenne pepper can cause stomach upset, diarrhea, and a runny nose. It is not recommended to take large doses of capsaicin supplements for a long period of time. Hi Vernon, I’m not sure what about taking cayenne internally. In the article I suggest using it as a topical application (see recipe here). You can have a look at my articles 14 Tips to Improve Varicose Veins Naturally, The Best Essential Oils for Varicose Veins and The Best Home Remedies to Get Rid of Spider Veins. However if your condition is really bad, home remedies will probably not help and you will need an advice from a doctor about a suitable treatment for you. I have been diagnosed with Bronchiestasis with plenty of coughing and yellowish-brown mucuse. Will cayenne help me? Some sources claim that cayenne pepper clears mucus from the lungs but I don’t know specifically about Bronchiestasis. I read about cayenne and bought a bulk jug of organic peppers. Most recipes I’ve seen recommend “1 t.” and such. I tend to throw a pepper in my tea w/ ginger, cinnamon, cloves, etc. Am I not getting the full benefit if I’m not actually eating the pepper? It’s still super spicy and is definitely thinning the mucus, but do I need to buy powdered instead? You can use either fresh or powdered cayenne pepper. The difference is that dried herbs are more concentrated than fresh herbs, so typically the conversion rate is 1 part dried herb to 3 parts fresh herbs, for example 1 teaspoon of dry herb equals 3 teaspoon of fresh herb (or 1/3 teaspoon of dried herb vs. 1 teaspoon of fresh herb) etc. You can drink cayenne pepper tea (about one quarter to half teaspoon of cayenne pepper steeped in a cup of hot water). Could u pleas4 tell me, raw or powedered. You can use raw or powdered. The general rule is that since dried/powdered spices are more potent than fresh ones, you need to reduce the amount of dried herbs to 1/3. For example: 1 tsp. of fresh herb = 1/3 tsp. of dried/powdered herb. Start from a very small amount as cayenne pepper is very hot. Iam taking ARVs is it health to use cayenne pepper? I’m not sure (I’m not a doctor). Best to get a “green light” from your doctor first. As mentioned in the article, cayenne pepper has the potential to treat prostate cancer. However, the research was conducted only in laboratory and it was tested only on animals. Researchers are still investigating the potential use of cayenne pepper to treat cancer in humans. So unfortunately you cannot use it to treat your cancer. In any case, I wish you a full and quick recovery. How do I use cayenne pepper for migraines? You can use it both internally or topically: Internally – Add 1/2 teaspoons of cayenne pepper in a glass of water (8 ounces). Topically – some studies have found that applying capsaicin (the active ingredient in cayenne pepper) can relieve migraines. For example: this study mentions capsaicin which was applied in the nostrils. All patients treated with capsaicin reported an improvement in their migraine. Also this study said that topical capsaicin 0.1% may relieve migraine pain. You can purchase capsaicin cream in the pharmacy (capsaicin is available as a 0.025% or 0.075% strength cream), or you can make your own cayenne oil.